Methods for the Ethnography of Communication is a guide to conducting ethnographic research in classroom and community settings that introduces students to the field of ethnography of communication, and takes them through the recursive and nonlinear cycle of ethnographic research. Drawing on the mnemonic that Hymes used to develop the Ethnography of SPEAKING, the authors introduce the innovative CULTURES framework to provide a helpful structure for moving through the complex process of collecting and analyzing ethnographic data and addresses the larger "how-to" questions that students struggle with when undertaking ethnographic research. Exercises and activities help students make the connection between communicative events, acts, and situations and ways of studying them ethnographically. 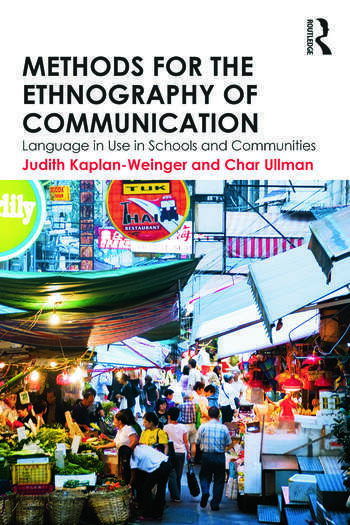 Integrating a primary focus on language in use within an ethnographic framework makes this book an invaluable core text for courses on ethnography of communication and related areas in a variety of disciplines. Section I: First Steps. Ch 1: Thinking about Doing the Ethnography of Communication: An Introduction. Ch 2:　Review of the Application of Ethnographic analysis to Different Domains. Ch 3:Identifying and Locating a Speech Community You Want to Study. Section II: The CULTURES Model. Ch 4: Compile your knowledge. Ch 5: Undertake observation. Ch 6: Locate Patterns. Ch 7: Trace Norms. Ch 8: Understand values. Ch 9: Review with participants. Ch 10: Experiment with hypotheses. Ch 11: Sharing your analysis. Section III: Reflections. Ch 12: Concluding Thoughts. Judith Kaplan-Weinger is Professor of Linguistics, and Coordinator of the Linguistics Program, at Northeastern Illinois University. Char Ullman is Assistant Professor of Bilingual/ESOL Education and Educational Anthropology at the University of Texas at El Paso.